With a combination of close to 300 hectares of terrain and a vertical drop of over 1000m, combined with the famous and traditional village, you are guaranteed to get the best of both snow and culture at Nozawa Onsen Resort. Considered the birthplace of Japanese skiing, Nozawa Onsen has beautiful powder and an abundance of tree and backcountry runs to ride, especially towards the top of the mountain. Both groomed and ungroomed slopes are long, totalling 50km, and so give you more ride time out of your visit. Beginners won’t be left behind with catered slopes high up the mountain, so they can enjoy the slopes and view to the fullest. The gondola and lifts are also conveniently placed to make it easy to get both on and off the slopes. Alongside the enticing ski conditions, the village also a boasting point for the resort. With steam rising from its bustling streets, Nozawa is a famed Onsen town, with uniquely-Japanese architecture, public bath houses, and footbaths scattered throughout the town. It is a true example of a classic, retro-Japan atmosphere which doesn’t disappoint. The town is a popular among both the Japanese and international visitors. Abundant facilities and services make for a great village both night and day, with everything accessible within walking distance. Accommodation is both wide-ranging and top quality, with Nozawa Onsen’s Ryokan Sakaya winning Best Boutique Hotel at the 2013 World Ski Awards. For a true cultural experience in combination with a powder-filled holiday, then Nozawa Onsen may be the place to go. 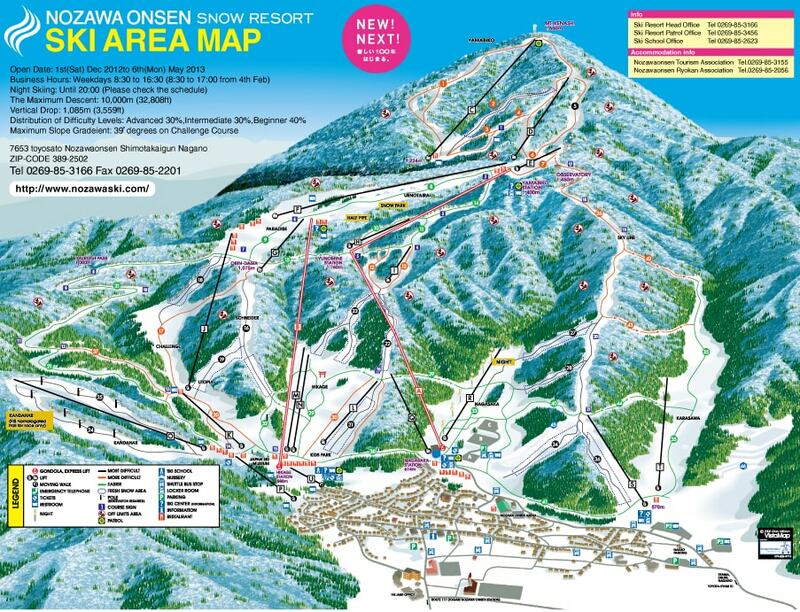 The Nozawa Onsen ski resort is situated in the north of Nagano Prefecture, 249 km northwest of Tokyo. 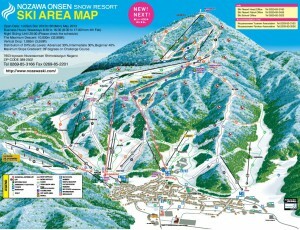 There are two main options for getting to Nozawa Onsen from Tokyo. Shuttle buses depart from both Narita and Haneda airports straight to Nozawa Onsen, and takes about 5-6 hours. Take the Hokuriku Shinkansen from Tokyo to Iiyama Station (1 hour 40 minutes) then take either a taxi or shuttle bus to Nozawa Onsen (25 minutes). Transport from airports or alternative modes of transfer from Nagano or Iiyama Station to the resort can be organised or arranged. Much of the Nozawa Onsen village is located close to the ski resort and so a lot of accommodation and facilities are within of both the lifts. Even if you are staying slightly further out, there is a shuttle that runs through the village to the lift station. Apart from skiing, the resort includes services to enjoy snowshoeing, snowmobiling, a kids park and a snow park. The town has over 30 natural hot springs which feed the many onsens throughout the town, including 13 public bath houses (Free entry!). 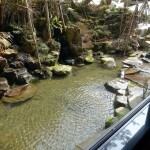 Onsens can be found both inside and outside, with many of the accommodation facilities having them. Popular with both local and international tourists, the onsens are a sight and delight in themselves. Taking advantage of the setting, it may be fun and a valuable experience to dress in Yukata and walk around the village. Your outfit will be in complete harmony with the setting and makes a great cultural experience, and not to mention the perfect photo op! Dosojin Fire Festival is an extremely popular annual event held every year on the 15th of January. Considered one of the grandest in Japan, the festival includes fireworks, fire, lanterns and a line-up of other performances and activities. It’s not uncommon to see the resort at its most crowded during this time. Several hire shops can be found throughout the resort and offer a range of ski and snowboarding gear. There are also a number of stores found in the main town street. Nozawa Onsen Ski School: The school caters lessons for all ages and skill levels. Private lessons are also available and in English as well. The resort’s Yumin Day Nursery facilities are rendered for children up to the age of 6 with all staff being qualified professionals. In addition, there are a number of family and children friendly amenities including an indoor playground area and a free-of-charge kid’s park. The resort has a large number of restaurants both on and off the slopes. The lively village offers a wide range and plenty to discover. 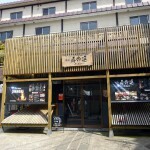 The rich culture and history of Nozawa has produced a unique culinary culture resulting in foods distinct to the area. These include ‘Nozawa-na Chazuke’ made from pickled Nozawa-na greens, which takes its name from the town. Another worth trying are the ‘Onsen-manju’ which are sweet buns filled with a bean jam. ATMs which accept international debit cards are available at the post office. Enjoy the most luxurious stay in Nozawa Onsen village in our traditional but modern Japanese-style ryokan. When you stay at Ryokan Sakaya you can expect a friendly welcome, high levels of service, a variety of onsen hot spring facilities and superb Japanese-style cuisine. You can feel the real Japan in these houses. Sit on tatami floors, sleep in a futon, eat dinner around a fire. Start the day with a healthy and delicious Japanese breakfast. Kawaichiya ryokan　is located in the center of Nozawa Onsen. We offer 2 different kinds of hot springs at our hotel and also serve local dishes for your dinner & breakfast. 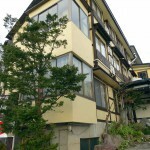 Please stay at our hotel upon visiting and sightseeing in Nozawa Onsen. We look forward to offering you our finest service and hospitality. The word JON NOBI has the meaning of ‘Relaxed and comfortable’ in local dialect. 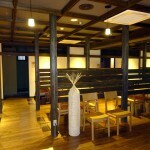 Come and experience your JON NOBI stay in the best ski and onsen village in Japan. 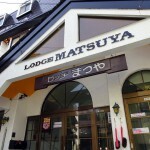 Lodge Matsuya is located in center of Nozawaonsen. A few minutes walk to the main street of the village. On the street , there are souvenir shops , restraunts , bars , general stores and natural springs etc. Located on top of the vllage,we have rooms and a large hot spring bath with a panoramic view.